San Diego Bay was discovered by the Spanish in 1542. 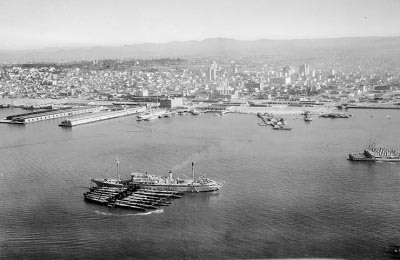 One of the finest natural harbors on the west coast of North America, it hosted numerous military facilities, including Marine Corps and Navy training centers in the Midway district, Destroyer Base San Diego and the West Coast Sound School, and North Island Naval Air Station. The modern city (117.159W 32.717N) was founded in 1867 by real estate speculator Alonzo Horton. San Diego was headquarters of 11 Naval District. 2 Marine Division was organizing here when war broke out. Coastal defenses were centered around Fort Rosecrans and manned by 19 Coastal Artillery Regiment.